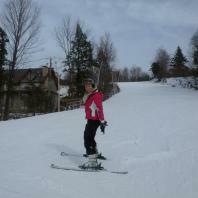 Montreal - Time to try this skiing malarky - Blog from Montreal, Quebec | Margaret in Wonderlands.. Rob dropped me to Heathrow for 11ish for my flight. After an easy check in and small queue through security I was in the shopping area. I had a little pain au chocolate. I landed in Montreal around 8pm British time and 3pm Montreal time. Rich came to meet me from the airport. After the bus ride home where he told me about an expensive parking ticket for getting Nandos at Christmas (£390) we arrived at this flat based centrally. He was in a cute studio flat with a blind for a wall. It was nice and cozy with open panel ceilings. I was really tired and it was only about 3/4 when i arrived but obviously 8/9 my time. We chatted and chilled out and then Rich went to pick up a Mc D's before I passed out at 9.30. On the first day we walked up the snowy hill to the lookout over the city. We walked around and saw people sledging. We then stopped in a little brunch style place and I had a bagel with cheese and Rich had an omelette. The size of the portions were massive which was to be expected. We then went for a little wander about before we headed back to chill out before dinner at a French restaurant. We went to this cute little place and it was all in French. We had a mix of little meals, snails and mushrooms, calamari, venison, cod with plum tomatoes, prawns in hot chilli sauce. It was amazing and we really enjoyed. We then caught the tube home. On the Monday we went for a little wander around the other part of the town, it was a cute cobbled street down by the river. We stopped in a little restaurant for lunch. It was 3 course and the first was a carrot soup. The second I choose nachos and the third was cheesecake. Needless to say I demolished my 3 courses whereas Rich struggled! We headed home to Montreal. We got back for about 4ish. On Tuesday, we went skiing. We went to a place called Mount Bromount. http://www.skibromont.com/en/ And I had an instructor called Barnard. I got all my ski gear and waited for it to begin. The first bit of news he gave me was that someone had died the night before. But of course it was a once off.. didn't do to much for my nerves. I explained I had been to a ski centre once and not for long in the UK. We went up to the ski school slope and he let me do my own thing really. Wasn't until the 4th round that he realised what I meant.. not a mountain.. more a indoor fridge :) We went for 45 mins and then he suggested heading for the bigger slopes. There was a green slope that was higher and longer and then there were the sheer vertical drops of black and red runs.. I was really nervous but wanted to give it a go. When we got there i managed to fall twice in 5 mins. And I think he was nervous I had hurt myself so suggested bringing me back down which was quite fun. Although so embarrassing when I saw kids flying down past me. Bernard told me to stay away form the bug slopes and keep practising and I felt quite disheartened. Me and Rich went for lunch and then I spent the last 1.5 hour on my own on the small slope and by the end I felt more confident. We had Thai for dinner and I struggled to finish that. Takeaway Thai- Thai kitchen. We should have more of these in the UK. On Wednesday we had a totally lazy day and stayed on the sofa most the day. It was really nice as it had been a busy few days. Rich made a chilli dish and we picked up some chips from a place that rated themselves like an English one. Not sure why as they were overcooked, like all chips in Canada. No where beats UK chips in my opinion. On Thursday we went for a wander around Montreal. We went down to the old town and the harbour and the snow was really deep. It was a pretty part of Montreal. There was a river which turned into an ice skating rink in the winter. We went to try and get a milk shake in Mc D's as Rich was determined but again they didn't do it (outrageous) We went to a place that did smoked meat sarnies with gherkins and chips.. the queue was not to bad but it was packed inside. It was called Schwirtz and is well known in Montreal. On Friday we headed off for day two of skiing. I spent an hour on the baby slopes on my own practising and then Richard came back to meet me. We went on the bigger mountain to see how I would get on. I was really nervous after day one but really determined to get it and conquer the mountain! I was a bit nervous at first and there was a part in the slope which I walked down as was a bit scared. On the third run there were some Asian people messing around so I got frustrated and overtook them. Once I did this I was off and loved it. A snowboarder took me out on my second to last run but not badly, I was just getting cocky! I started to really enjoy it but it was time to finish up and head home. We had a cheeky Mc D's on the way home and we were both tired. We got home and Rich cooked a pork dish which was pretty tasty. On Saturday we went to the shops and I picked up some chocolates and treats for the family. The tax business still confused me and it was so expensive to get a few treats. We then went to watch 'Beautiful creatures' at the cinema as it was pretty snowy outside. It was pretty pricey to go cinema, like home $35 for tickets and some nachos. We then headed home before getting ready to head out for Chinese. We went to China town and after a bit of walking around we opted for a little restaurant that was packed. Luckily we didn't wait to long for a table, we ordered some steamed dim sum and a fried one. We also choose 4 mains. When the girl came over she said that was a lot so we dropped the rice. We ended up with beef curry, noodles (not so good) and some chicken kung po i think! It was delicious but we had to take it home as it was to much. On the Sunday we headed out for some brunch and the plate was massive.It was called Eggspectations I went for a bagel with cheese and bacon and then the other half was a different cheese. Rich had the eggs benedict and I tried half and they were yummy! We then headed back through the town and there was a show going on which wasn't that exciting to be honest. Apparently Montreal love putting things on which is nice. We then chilled out and headed off to the airport around half 4. There was no traffic so we were there around 5.15. I checked in and we shared a burger king before the flight. I then went to go through security and some silly rude woman pushed in front of me, she even turned out to English!! She got her payback when she ended up back of the queue when it was time to get on the plane. I arrived back a bit later then planned around 8.30 and then i rang my cabbie who had been hanging around to get him to come and get me from departures. He was very nice and I got home just after 9am. I unpacked and stuck on washing and then got back on the laptop to check work emails.. It was back to reality. I was due to give blood that afternoon but when I was being preped, I told the nurse and she couldn't take it which was a shame. I was exhausted so I stayed awake the rest of the day bar one nap for an hour.